We said goodbye to our beautiful ship this morning and we drove into downtown Athens. First we went to mass Mass at the Cathedral of Athens Dedicated to Saint Dionysus the Areopagus. We then drove around Athens for a tour before arriving at the Acropolis. I started out by taking everyone up to the top of Mars Hill to read Acts Chapter 17 about Paul’s time here. You can hear/see the whole talk on the separate video below – and see pictures as well. 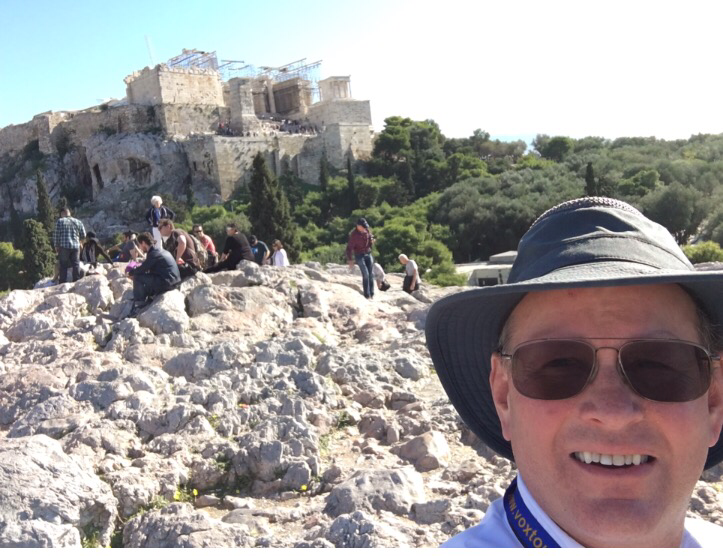 Then to the top of the Acropolis to visit the Parthenon before coming down for a nice lunch on the boulevard and arriving at our Metropolitan Hotel. In the evening Fr. Larry Richards and I sat up in the front and fielded questions from the group. Panel discussions like this are always fun. Then a great dinner and off to bed and early start tomorrow to visit Corinth. I can Imagine the Life around Mars Hill and The Agora repleted with Statues and Paul Sharing the word of GOD.. while experiencing the Pagan Statues..
Aristotle Plato and Socrates were before Paul in the same setting is simply amazing to witness the Building of the Early Church..